And there is no better place than to enjoy you long weekend then at the beach. Just because the summer is coming to an end (ugh!) it doesn’t mean it’s too late for you to summer bod ready. To help get you started, I’ve created this 7 minute beach body Labor Day workout that you can do anywhere. In this workout I have combined both strength and cardio to help you get the most out of your time. So, let’s get it going! 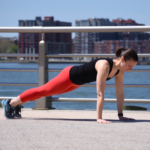 Plank is a classic move that most of us don’t do often enough. This is a basic plank either on hands or forearms. Love me some great glute-action (most of us don’t get enough of this). You can do this with both feet on the ground or you can do the exercise as pictured- one side for 30 seconds then switch. I love this move. It’s an alternating up-down, from plank on your hands to plank on your forearms, one arm at a time. Feel free to use your knees if needed! For this exercise, do a pushup (on your knees is fine! ), put your whole body on the ground then lift your hands, then push yourself up and repeat. This exercise is basically mountain climbers, but high-speed. You’re jumping between (see above). You can also do traditional mountain climbers here instead. Repeat this circuit 2 more times! Finish up with a 2- 5 minute cool-down and stretch.